This past month, Enough Project Co-founder John Prendergast was honored at two different events for his ongoing work as a mentor and human rights activist. On April 13, MOSTE, or Motivating our Students through Experience, hosted its annual luncheon in Los Angeles, CA. MOSTE works to empower girls from underserved areas of Los Angeles to become the next generation of college graduates prepared for professional careers and positions of leadership within their communities. Over 300 people attended the luncheon where Prendergast was a recipient of the 2012 Lanterns Award for his longtime work as a mentor and "big brother." Prendergast details his work as a mentor in the 2011 memoir Unlikely Brothers, which he co-authored with his "little brother" of nearly 30 years Michael Mattocks. 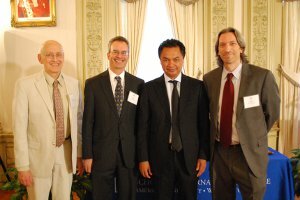 On April 11, American University hosted an event at The Embassy of Indonesia in Washington, D.C. where Dean James M. Goldgeier honored Prendergast as Alumnus of the Year. Prendergast was recognized for his longstanding commitment to ending crimes against humanity. "I remain committed to build a constituency of people committed to peace and justice in Africa," said Prendergast in his remarks. "Thank you for the inspiration you gave me to keep following my dreams." Prendergast received his MA from American University's School of International Service in 1990.